Fan bikes normally come with just one form of resistance and that is air resistance where the faster you pedal the more resistance there is. You are pushing a fan wheel around which is what causes the resistance. They don’t normally have any way to manually adjust the resistance like you do on a spin bike, but there are some. This increase as you pedal faster is part of the attraction as to get more intense workouts you just need to pedal faster – the other benefit is that you get to exercise your arms at the same time. This combination is what gives them the nickname of the misery machine. However, Not everyone just wants that type of workout, they also want to be able to adjust the resistance to the level they want without having to pedal faster or slower. Some people are disappointed when they buy a fan bike and realize they can only adjust the resistance by pedal power. As noted, there are some bikes that do combine this although the contribution of the fan is less at any level of resistance – you don’t then get as much increase in resistance as you do with the fan bikes that just have air resistance. This can reduce the misery factor! The bikes that offer this do tend to be at the more affordable side of fan bikes as none of the premium priced bikes offering this type of resistance adjustment. This does make these bikes more suitable for beginners than seasoned athletes and trainers. They are for people looking to lose weight, get in shape and stay in shape with more moderate levels of exercise rather than those “crazy” levels some of the CrossFit types and others are after. With the pricing of these bikes it makes it easier to progress to more advanced bikes if you want (these advanced bikes can be used by beginners too) or if you change your mind and want to achieve your fitness goals a different way they haven’t cost you fortune. On this site at present we’ve reviewed 2 fan bikes that have the manual resistance adjustment. They work with a knob on the frame that you turn to increase/decrease tension on a tension belt that goes round the fan wheel to increase/decrease the amount of resistance you are pushing against. It does mean you do need to be more careful when pushing against the higher levels of resistance but for most people should be okay as these bikes are for use seated but just need to work on the down stroke so it doesn’t become push down that bottoms out. Here Are The Bikes That Give THat You Can Manualy Adjust The Resistance. Stamina ATS Air Resistance Bike. This fan bike is price below $100 at present and very good price for a fan bike especially for those looking for low impact cardio in their home. It provides a stable platform for workouts and makes a great starter bike or for those people wanting to recover from injury (if doctor agrees) as it is low impact or those looking to lose weight or get in shape and/or stay in shape. The resistance is adjusted using a knob on the frame that tightens and loosens the belt on the flywheel – it goes from easy to hard. It comes with a basic console to help to keep you on track as you workout. It measures RPM, distance, speed and calories burned – these are more for comparative purposes rather than to be taken as accurate as they are calculated estimates at best. The seat can be adjusted for people to use up to the height of 6 ft 5 ins which is quick to do, so it can be used by multi users in the home for their cardio exercising. Reviews online state they like the price, the smooth ride and that it holds them steady while they do their exercising. Read our full review here. This bike is priced currently under $100, making it a very affordable fan bike. 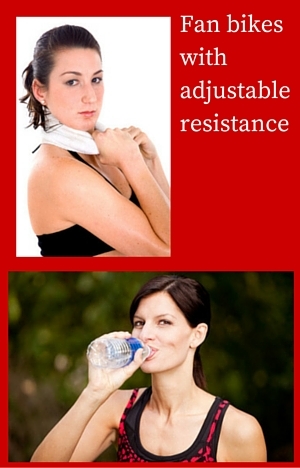 It also has a bit of an involved way to adjust the resistance. You can use the tension knob on the frame to increase by a moderate amount. However, if you want to increase by more than this you have to get off the bike and adjust the belt it uses manually by pulling it further through a buckle. Getting the right setting on this is a little awkward as you need to get back on the bike to test it, but most customers are okay with the compromise especially because of the price. There is no marked guidance on this to help you nor is there when setting the resistance with the knob. The air resistance is fairly minimal and not as strong as you experience on higher priced air bikes, so there is not much variation as you pedal does makes the resistance more constant to help you judge how hard you are working. To help you track your workouts there is a basic console that measures RPM, distance, speed and calories. Customers like the bike but they are not fans of the low height limit or the seat as they find it hard on their sit bones (you get this with most exercise bikes with bike seats). Read the full review here.